Spoil your mother with a special gift of luxury handmade soap for Mother’s Day. 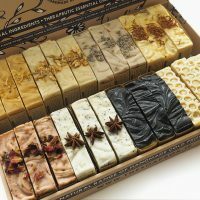 Our luxurious range of handmade cold process soaps are made from a unique blend of pure essential oils and the highest quality natural ingredients. All of our handmade soaps contain a distinctive exfoliant to gently cleanse and renew the skin. Our handmade soap range is the perfect gift for any mother who appreciates pure natural handmade products.